My own favorite story of encountering our demons comes from Harry Potter and the lesson on learning spells to deal with the boggart. Boggarts are shape shifters that dwell in dark, confined spaces, and when let out take on the shape of our deepest fears in that moment. The spell that disarms them is to shout out ‘Riddikulus!’ and to image them at their most hilarious, dressed most ridiculously, and to ensure that they are given no power to feed the fear, and in doing so the fear evaporates and disintegrates into the laughter of this moment. But hesitate, and the boggart, and with it our fear, grows, takes on an embodied form, and threatens to overwhelm us. Such is our fear of being overwhelmed by them that we rarely, and often then only under duress, let our fears out into the daylight. For the most part keeping them locked up and confined. And in doing so allow them to fester, to grow, and be nurtured by the fertile imagination of how they would overwhelm us. Facing death, and facing our fear of death, can be just such an experience. The ugliest, largest, and scariest of beastly boggarts. One of the first palliative patients that I cared for at his home, many years ago, presented me with just such a challenge. A young man of the Islam faith, his family very religious, very loving, caring, and involved, and desperate to save his life, and if not this then eventually to minimise his suffering. He found himself completely dependent, bed bound, and tenderly cared for by mother and young sibling, eventually needing to allow my presence in due to the overwhelming nature of his pain. Building of relationship and trust took time, with issues of gender, age, race, religion, culture, all delicate presences to be acknowledged and taken into account. Even simple things that medical professionals often take for granted, like making eye contact, being able to touch and examine our patients, needed to be negotiated with utmost acceptance of each moment, what was present, and with patience. After some time had elapsed, we’d developed a relationship and built trust, he asked me to revisit his diagnosis with him, to discuss his prognosis, to engage with the deepest of fears around his pain, his tumour, his dying. And in the dialogue we came to a point where it felt right for him to engage with this all consuming fear and visualise what it looked like. The image he produced was that of a large red, pinkish, maroon, octopus with many tentacles, wanting to challenge him, to be larger than him, and to consume him. He did not interact much with the octopus itself other than register its presence and menace, and accept its desire to completely consume him. This acknowledgment and acceptance left my patient feeling calm and at peace, as if a great weight had been lifted from his shoulders. He died peacefully a few short days later. Being new to these experiences, this meeting of the moment just as it is, this encounter left me ruffled and disturbed for quite some time. I felt I had not adequately resolved the encounter with the fear and that it had been allowed to overwhelm my patient. I was unsure as to how to interpret his peaceful surrender to its presence. Only many months later while reading Rachel Remen’s book did I come to an understanding of what had unfolded. She describes working with a patient who had a recurring dream of fleeing from a beast that kept chasing after him, threatening to consume him. Dr Remen asked her patient to revisit with the dream while in her rooms, and when the beast was present to stop fleeing from it, to turn toward it and allow himself to be eaten by it. To stop fleeing as there was no escape. And in being consumed thus her patient came to a point of absolute calm, of complete peace. In reading this I realised the experience of my patient was not to have resolved the consuming nature of the struggle he faced, because there was no escape for him from his reality, the resolution came with accepting the nature of the struggle, and in surrendering to the fear, to allowing himself to be consumed by the octopus. Perhaps all healing eventually comes through allowing ourselves to be completely overwhelmed. Surrendering, finally, to the fear, to the beast, and the boggart and meeting whatever arises. It has taken me many more years to understand the constant nature of this struggle with our beasts, our boggarts, and our ever-present fears. That everything demands surrendering to and turning toward, and in doing so death surely arrives and consumes us. Perhaps not always a literal death, but a death non the less. The death of holding on so very tightly to how we wish this moment to be, to this thought, this struggle, this fear in just this particular way, and therefore enabling room for new growth and new birth of being in relationship with and to this fear, to this beast, to this boggart, in a very different form, that may turn out to be beauty itself and bring laughter and joy.
? 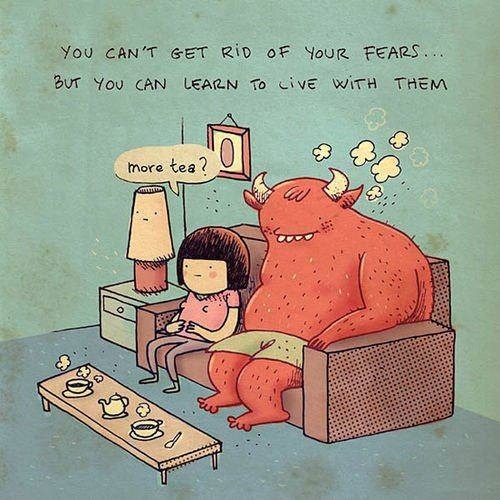 ?What beasts will you be inviting in for tea today??
? ?What boggarts will you be letting out of the closet?? This entry was posted in Courage, difficult emotions & death in every moment and tagged attention, care, courage, death, difficult, dream, fear, listening, pain, presence. Bookmark the permalink. Thank you for this. Very beautiful and profound.